Here at Anycity Nonprofit Organization, we're pretty awesome. We achieved a lot this year, but we still have more work to do. We need your $50 donation, so we can continue helping our community. Would you make a donation to Anycity Nonprofit Organization? Who would really ask their donors (or potential donors) for a gift this way, right? But, unfortunately, a lot of nonprofits approach their supporters and prospects this way, focusing on the organization instead of its constituents. This is a bit of an extreme example, but nonetheless, illustrates organization-focused fundraising instead of donor-centric. So, what exactly is donor-centric fundraising? Basically, it's focusing on the wants and needs of your donors, not your organization. Donor-centric fundraising is finding that sweet spot of balance between relationships and results. 101fundraising said it best: it's not relationships vs. results, it's about relationships for results. If you focus too much on getting results and not enough on the person behind the gift, you'll have great results in the short-run but absolutely hurt your long-term sustainability. Nobody will continue giving to an organization that only focuses on getting their dollar. On the flip-side, you don't want to completely ignore your results either. At the end of the day, you need donations to continue running, and you have to make the ask. Bottom line - donors want to help and want to give, but they also want to be treated like people, not ATMs. 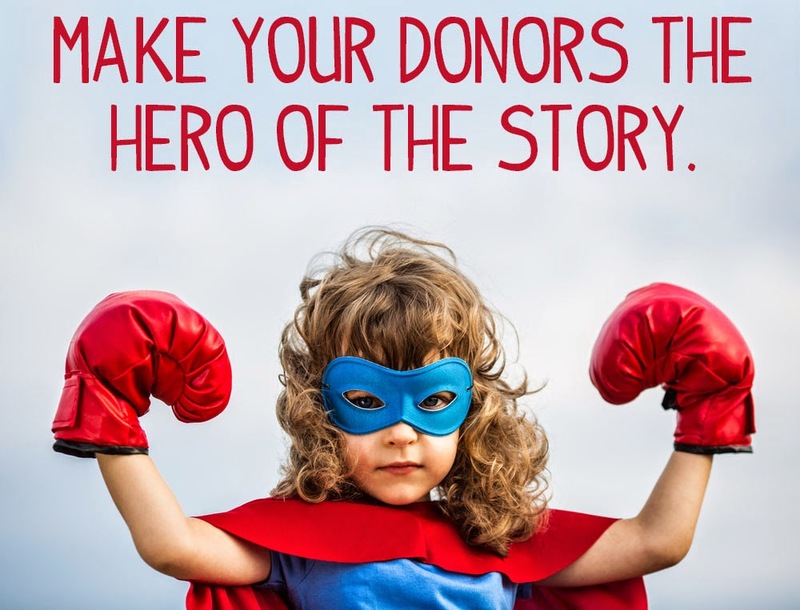 So, how can your organization become more focused on the donor? Yes, it costs money to do, but put yourself in the shoes of a donor, potential donor or anyone visiting your website on their phone or tablet. You find yourself zooming in and out, scrolling side to side and squinting to read the site. Not only is this incredibly frustrating, but there's no way you can make a donation this way. It's 2014 - people access emails and websites A LOT via their phone or tablet, including making donations. Please, make it easy for them to do. Seems pretty basic, but if you read our last post, you know many organizations still struggle to effectively thank donors. Timely, sincere letters personalized to the donor make your supporters feel truly appreciated and valued. Sure, this takes a little more time and effort on your part, but it's noticed by your donors. Take your acknowledgments up another notch by adding in thank-you phone calls. Most organizations have a staff member personally thank their large donors, but phone calls to new and regular donors are just as appreciated and delightfully unexpected. It's been proven that the more information a donor has to provide and the longer the donation process takes, the more likely they are to abandon the donation. A lot of clicks = a lot of opportunities to cancel the process. Ideally, someone should be able to click your "donate" button and be taken immediately to the form, where only a couple more clicks will finalize their donation. The only required fields should be the ones needed to process the gift. Yes, you can include other fields on the form, but make them optional. Make the online donation process as short and sweet as possible. People connect to faces and names, not numbers. That doesn't mean you can't share your statistics, but find a way to link it to a story. For example, "The Food Bank of Anycity provides food assistance to 20,000 people every week. This is John's story..." Statistics engage the mind, stories engage the heart. Find a happy medium between statistics and storytelling. Put a face and a name to your mission. Instead of talking about everything your organization does, talk about everything your donors do. For example, rather than saying, "Last year, the Anycity Humane Society rescued 10,000 animals," say, "Last year, you helped the Anycity Humane Society rescue 10,000 animals." Adding in the "you" makes your supporters feel connected to and actively responsible for your success. Use "you" more often than "we," "us," or "our" - show how great your donors are, instead of how great you are. Donor-centrism doesn't mean your results become second priority. Rather, donor-centrism is strengthening your relationships to achieve better results. It's creating fundraising campaigns that focus on the donor experience. It's engaging with donors and prospects in ways that interest them. It's making your supporters feel actively involved with your organization and its accomplishments. Seek to maintain a balance between relationships and results - that's where long-term sustainability is achieved. Wow! I think you better can help crowd fund raising with your mass communication. Givetaxfree.org helps donars and receipents can receive the facility to have donations without paying taxes.